Summary of today’s show: Fr. 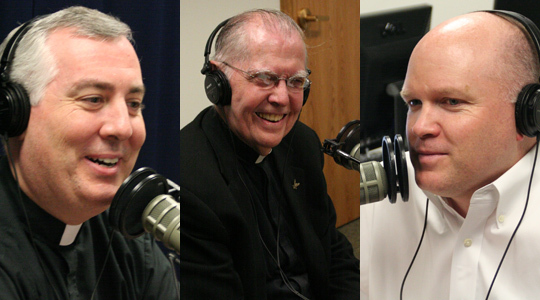 Gerry Dorgan joins Scot and Fr. Mark to discuss his 53 years in the priesthood; his 20 years at St. Mary in Danvers; how he ended up teaching in the seminary after just 5 months as a priest; what makes a good homily (hint: not that’s short! ); and his love of art and art history. Also, this Sunday’s Gospel from Mass. 1st segment: Scot welcomed Fr. Mark back to the show. He asked how his summer is going at its halfway point. He is starting his vacation this weekend. on today’s program, one of Fr. Mark’s former pastors, Fr. Jerry Dorgan, will be on the program today. Fr. Mark was at Fr. Dorgan’s parish for two years before he was sent to Rome to study canon law. Fr. Mark will always remember how Fr. Dorgan gave him a good sendoff from the parish. Fr. Dorgan was also Fr. Mark’s homiletics professor in the seminary. When Fr. Mark presented his first homily to the professor, Fr. Dorgan said it would be a very good children’s homily. Unfortunately, Fr. Mark was not writing a children’s homily. 2nd segment: Scot and Fr. Mark welcomed Fr. Dorgan to the show. He is celebrating 53 years as a priest this year. He has been at St. Mary in Danvers since 1991 and was at the seminary before that. He began his priesthood at St. Margaret Mary in Westwood, but wasn’t there long because he was suddenly drafted to Cardinal O’Connell Minor Seminary. He attended graduate school at night and studied English Literature and also taught American history. He was 24 years old, had been ordained for four months, and was suddenly teaching English and history. Fr. Dorgan graduated from St. John Prep at 16 and then attended Holy Cross College. He’d already been thinking about the priesthood and at the end of the year he transferred to the seminary. After ordination he taught at seminaries until being made pastor in 1991. Scot was surprised that Fr. Dorgan has had only three assignments in his priesthood, which is very unusual over such a long period. He also did a religious talk show on WBZ Radio. The year he was ordained, there were 61 in his class. St. Mary’s in Danvers is a wonderful parish. They have about 100 people who come to daily Mass to the 7am and 9am Masses. Scot has heard that there is a tradition in the parish that after Sunday Mass, the people kneel after the final song and pray a prayer of thanksgiving. Fr. Mark also heard that the original St. Mary’s Church was demolished during the construction of Route 128 and that it was a good thing because the old building in such bad shape. The new church was built by Gray Architects, who have built many beautiful churches in the area. In 1998, they built a parochial school. Fr. Dorgan said it is going very well. It is shared with St. Richard of Chichester Parish in Danvers. It was founded by the Sisters of St. Joseph. There is a strong relationship with St. John’s Prep. Having taught at the college seminary for many years (St. Clement’s Seminary), he had taught many of the priests who serve in the Archdiocese today. Fr. Mark noted that Fr. Dorgan’s collection of books took over many rooms at the seminary. Fr. Mark estimated that there were many more than 10,000 volumes. One day he told Fr. Dorgan about a favorite Wyeth painting in the Museum of Fine Arts. So Fr. Dorgan found a book with the image of the painting and gave it to Fr. Mark. He told him he’d been hoping to count down his collection and Fr. Mark said he would need to give away many more books to even make a dent. 3rd segment: Fr. Dorgan taught homiletics in the seminary. He noted it’s never been particularly noted as a strength in the Catholic Church. Scot asked him why it’s not one of our strong suits compared to other Christian faiths. Fr. Dorgan said in Protestant churches the primary experience of Sunday worship is the homily while the Liturgy of the Eucharist is of equal importance to the Liturgy of the Word. He thinks it’s important for the people to hear God’s Word and to love and live it. Scot wonders if the problem is that laypeople encourage shorter homilies or if it’s that priests are so busy during the week that they don’t put as much preparation into it, especially if people aren’t going to appreciate a long homily. Fr. Mark asked how helps a seminarian who is a terrible preacher. Fr. Dorgan said they often just need help determining what the message should be and how to deliver it. He believes that prayer is a key part of preparing a homily. Fr. Mark said Fr. Dorgan would not allow his students to have notes in front of them when preaching. Fr. Dorgan said a man would not read from a paper when on a date with his wife or girlfriend. Scot said he would certainly never do that if he wanted a second date. Fr. Dorgan said a Sunday homily should be 10-12 minutes. If it’s well done it doesn’t seem very long at all. During the week, he might speak for a minute or two. Scot asked when you have such a diverse audience for the homily, how do you prepare for it to address everyone. Fr. Dorgan said that strictly speaking the Lectionary is the basis of the homily and so the priest studies the readings to determine what it means to him and to the situation of his parish. 4th segment: Scot noted that Fr. Dorgan also studied art history to teach it in the seminary as well. Fr. Dorgan said he thinks there’s a tremendous potential in art history, particularly in Western art where so much of it is religious. He puts reproductions of fine art in his church to expose the congregation to beautiful religious art. A picture is worth 1,000 words. Art in Roman Catholicism is a tremendous part of our tradition. He was not himself an artist, but his family were lovers of art and he went to many art auctions as a child. He has a triptych of the Annunciation in the Museum of Metropolitan Museum of Art. It is in the Cloisters Museum of the Metropolitan Museum. He is also a big fan of Albrecht Durer. His favorite museum in the world is the Louvre in Paris. He loves Chartres Cathedral outside of Paris. In Italy, Florence is his favorite place for art. When showing art, he prefers reproductions instead of slides. He prefers to be able to see the art in three dimensions as it was intended. There was a discussion of the sacred art in the churches of Boston, especially in churches that have closed. Most of the art has been preserved. Scot noted that Immaculate Conception in Newburyport and St. Mary in Dedham have beautiful art. They also agreed that the two parish in Charlestown and St. Mary in Melrose are also beautiful. Scot added that St. Anthony of Padua in New Bedford, where his brother is pastor, is the most beautiful church in the United States. The church was built to be the cathedral when the area become a diocese, but it was placed in Fall River instead. Scot said the Cathedral in Covington, Kentucky has the largest stained glass window in the United States. Fr. Dorgan recalls a professor telling him that great writers have one thing to say. The Bible is a big book and has one thing to say: I’ll be with you. I’ll be the one who’ll be there with you. In exodus 3, the Lord says to Moses to go to Pharaoh to let his people go. The Lord says, “I’ll be with you.” He does about 130 funerals in his church each year and the people often choose the reading, “If God is with us, who can be against us.” The good news is that we do not walk alone. Scot said God is sowing good seed, which is us. Even if we have a small seed of faith, God will make it grow. Mother Teresa going to Calcutta with millions of people in need. Look at the good she did for Calcutta and the entire Church. The weeds are those things in life which take us away from God, which distract us from him. Fr. Mark recalled Mother Teresa said that if you want to feed everyone in the world, start with one. The message of the mustard seed and the yeast is essentially the same. When Fr. Mark was ordained his uncle, Fr Dana Delaney, preached the homily. He said the yeast is the opposite of the bad apple. You plant the yeast and it makes everything grow, whereas one bad apple ruins the barrel. Scot said the last line is almost in-your-face because everyone has ears and so they are all called to hear. Fr. Mark notes that the owner of the field lets wheat and weeds grow together. We give the weeds a chance because they might be wheat in the end. God is patient with us and stays with us in difficult times.